Perfect for a 3 day getaway. Eid Al Adha is just around the corner and if you are like us and haven't made any travel plans yet, do not worry. The UAE has so much to offer from wonderful spa resorts to hotels that make you feel like you've transported to an urban oasis and even straight up ski resorts in the middle of this blazing heat! Here are the top 5 spots ideal for a staycation this Eid. A ski vacation when it's close to 50 degrees outside? Yes, it's possible! Choose one of the unique Ski Chalets by Kempinski to experience an alpine retreat in the middle of the desert, overlooking Ski Dubai! The modern rustic Aspen Ski Chalets offers the warmth of a cozy lodge with views of the powdery slopes of Ski Dubai. Equipped with luxurious Hermes amenities and state-of-the-art in-room technology, this intimate winter retreat is complete with a stone faux fireplace, a spacious marble bathroom, a kitchenette and exclusive access to a dedicated Butler service. Located in the legendary Rub'Al Khali, the largest uninterrupted sand desert in the world, Qasr Al Sarab Desert Resort by Anantara embraces the epic adventures of this evocative landscape by providing a luxury oasis for discerning travellers. Recline by the plunge pool outside your own private villa, or stretch out on a sumptuous day bed surrounded by rich Middle Eastern fabrics and local artefacts. Be prepared for quite the drive though - this one will take you approximately 3 hours to get to from Dubai. 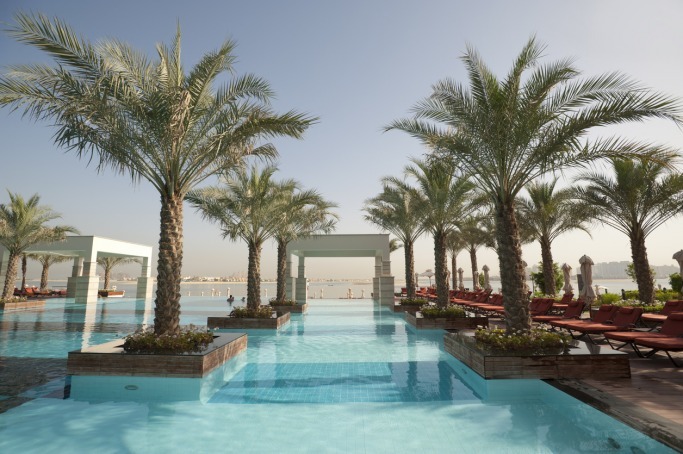 Rated as the best hotel in Dubai by travellers on TripAdvisor.com, you cannot go wrong with the One&Only The Palm, Dubai. If a relaxing and indulgent spa break is what you are after, this is an ideal choice. Their Guerlain Spa is simply out of this world. If you are an art lover, this one is for you. Fujairah’s only art inspired resort, this luxury sanctuary comprises just 180 guest rooms and suites, all of which features either marina or ocean views. A showcase of art pieces from around the globe, the resort’s interior design is a juxtaposition of modern bohemian meets art-deco infused with arabesque touches. A hidden haven in the peaceful Emirate of Ras Al Khaimah, Waldorf Astoria Ras Al Khaimah is an ideal destination for an unforgettable getaway. The resort offers signature attentive service, nine stylish restaurants and lounges, and elegant accommodation with pristine views of the Arabian shoreline. This one's perfect for a family vacay!